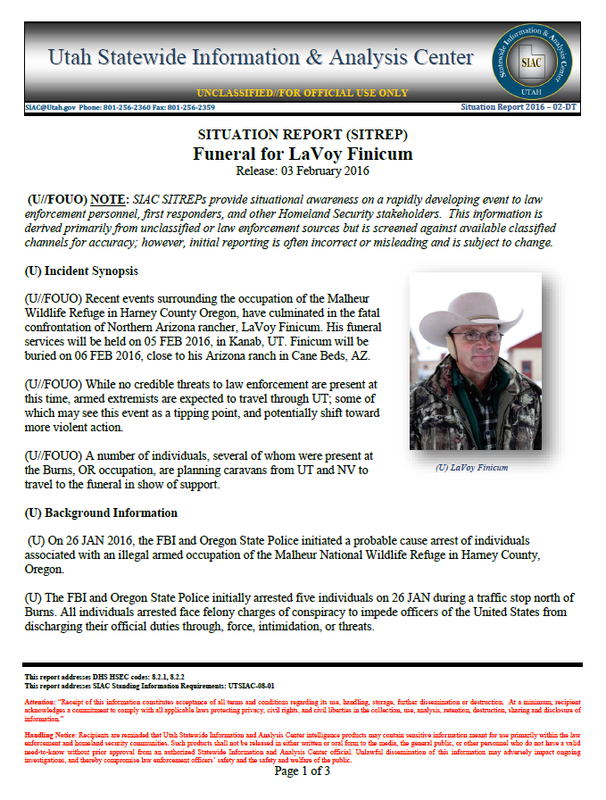 The following bulletin was released by the Utah Statewide Information and Analysis Center prior to the funeral of LaVoy Finicum, a participant in the occupation of the Malheur National Wildlife Refuge who was shot and killed by authorities on January 26, 2016. The bulletin was obtained and published by Reason. (U//FOUO) Recent events surrounding the occupation of the Malheur Wildlife Refuge in Harney County Oregon, have culminated in the fatal confrontation of Northern Arizona rancher, LaVoy Finicum. His funeral services will be held on 05 FEB 2016, in Kanab, UT. Finicum will be buried on 06 FEB 2016, close to his Arizona ranch in Cane Beds, AZ. (U//FOUO) While no credible threats to law enforcement are present at this time, armed extremists are expected to travel through UT; some of which may see this event as a tipping point, and potentially shift toward more violent action. (U//FOUO) A number of individuals, several of whom were present at the Burns, OR occupation, are planning caravans from UT and NV to travel to the funeral in show of support. (U) On 26 JAN 2016, the FBI and Oregon State Police initiated a probable cause arrest of individuals associated with an illegal armed occupation of the Malheur National Wildlife Refuge in Harney County, Oregon. (U) The FBI and Oregon State Police initially arrested five individuals on 26 JAN during a traffic stop north of Burns. All individuals arrested face felony charges of conspiracy to impede officers of the United States from discharging their official duties through, force, intimidation, or threats. (U//FOUO) Currently, the SIAC assesses no credible threat to law enforcement or to public safety. 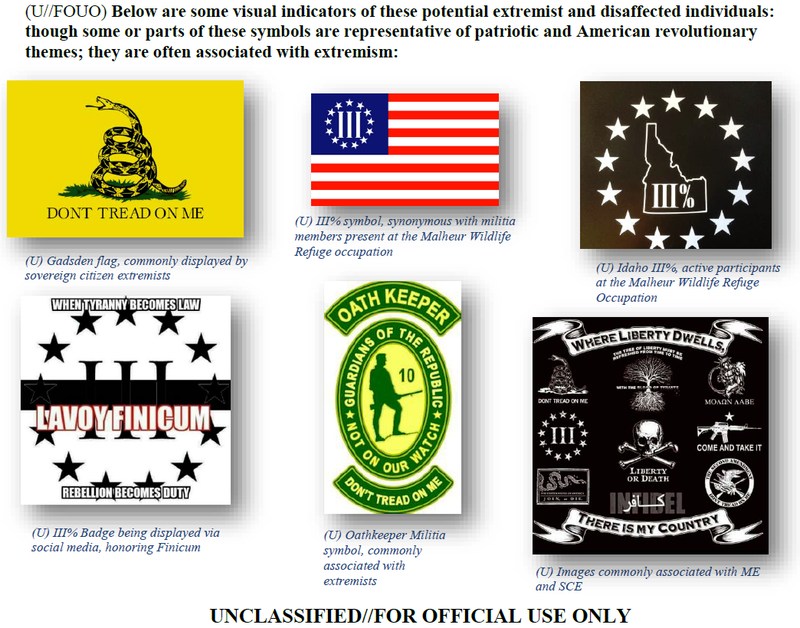 (U//FOUO) The Finicum family has requested a quiet, private service, however, extremists may utilize such a high profile funeral for media attention or to further ideological beliefs. In conjunction with the funeral, several social events have been planned in Kanab, UT over the weekend which could provide an environment for extremist activity. (U//FOUO) With the amount of support on social media which some domestic extremists involved in the funeral have received, law enforcement should remain cognizant of the likelihood of the presence of domestic extremists travelling within their AOR. This may include both militia extremists and sovereign citizen extremists. (U//FOUO) Caravans of individuals traveling to the funeral services may be comprised of one or more armed extremists. Law enforcement should remain vigilant and aware that confrontation with these potentially volatile persons, may include more than one individual. These individuals may adhere to a sovereign citizen ideology, and may not recognize law enforcement as a legitimate authority.